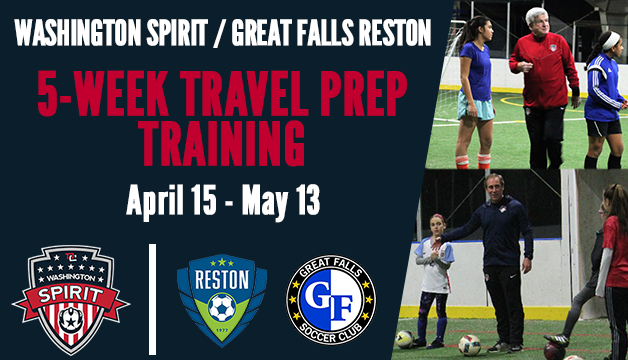 Boyds, MD (April 4, 2018) – Washington Spirit Academy and the newly-formed Great Falls – Reston SC will begin the first stage of their recently announced player development partnership with a five-week Travel Prep Training program. The Sunday night training program will provide girls and boys in the 2010 birth year age group – and players born in 2011 who plan to start U9 travel soccer a year early – with exposure to advanced drills and instruction from Spirit Academy and GFR coaches. Players will have the opportunity to develop their skills in an environment specifically designed to prepare them for travel soccer, which for girls, would include the chance to become a member of a GFR Spirit U9-U12 pre-academy team for Fall 2018 play. Boys are also encouraged to attend as a first step towards preparing to start travel soccer as well. The program is not limited only current GFR players, and this is not an official tryout for any specific club or team. The training program will be overseen by new GFR Spirit youth programs coach Jane Dawber along with additional GFR and Spirit technical staff members. A Washington Spirit professional player and a Spirit professional team coach will also each attend at least one session. GFR Spirit Travel Prep Training begins on April 15, and will run through May 13. The clubs will also be hosting ID sessions later this month for all players interested in being a part of any rising U10, U11, and U12 teams GFR teams, including the new GFR Spirit pre-academy program. As previously announced, the GFR Spirit program will consist of normal club training and games with GFR coaches, but will add a supplemental training night run by members of the Spirit’s U.S. Soccer girls Development Academy staff. The Washington Spirit operates the only two U.S. Soccer Girls’ Development Academy programs in the greater Baltimore / Washington Metropolitan areas that are connected directly to a professional women’s soccer club in the National Women’s Soccer League. Some of the most talented players throughout the region – including several U.S. Youth National Team members – compete on our teams in both the Northern Virginia and Maryland areas. Through partnerships with several regional youth clubs, the Spirit are deeply committed to supporting the development of every player at each club, while working closely with those partners to provide a professional pathway for the most elite female players as they progress towards the dreams of playing professional soccer. Great Falls and Reston Soccer clubs recently merged to form a new club that will be fully operational in the fall of 2018. By merging, the club has added a larger base of players across their Recreation and Travel Programs. Combining the number of fields from both clubs will also increase the footprint of the club. The new club hopes to capitalize on the current strengths of both organizations; a strong travel organization from Great Falls and a robust Recreation Program in Reston to provide quality Programs and teams across the U5-U19 age ranges.